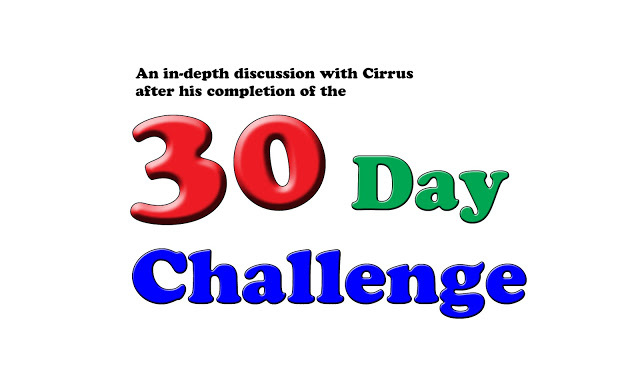 Throughout the month of July, and into the early days of August, our friend Cirrus took on a 30 day challenge. For this challenge, Cirrus promised himself that he would write for at least 30 minutes each day for 30 consecutive days. During this time he kept the entire community informed with in his advancement each day by posting a quick message on the Shack’s Voy forum. Cirrus did not only succeed in his challenge, but he also inspired others to challenge themselves. Not long after his challenge was over, I harassed him to answer some questions to help anyone else who is thinking about taking up a 30 day challenge of their own. Inevitably, he soon caved in and the interview began! 1. What did you hope to gain from the challenge? I was reading some self-help book that suggested using a “30 day challenge” as a way of ingraining good habits. I think we’ve all got good habits that we’d like to develop further, whether it’s writing regularly, or going to the gym more often, or going for a run every day. Apparently it only takes 21 days to ensure a habit sticks, but I guess 30 days is a good safety margin. And it’s easier to tackle something like “I’ll write every day for the next 30 days” than “I’ll every write every day for the rest of my life”. So in some ways my 30 day writing challenge was a test run to see if I could use the same technique elsewhere. I’ve always been a lazy writer. I’ll start writing something then abandon it. Or stop and re-write frequently. Or finish one story then go months or even years before writing something else. I’d like to be a published writer someday, but to do that I have to actually write more, both for the discipline and to improve my writing. I look at Comsie’s consistent, regular output and I’m in awe. The final reason I took up the challenge was that I had come up with an idea for a story at the beginning of the year, and I’d been finding every excuse under the sun *not* to write it ever since. So this challenge would force me to work on the story, and hopefully complete it. 2. What were the rules of the challenge? I set myself a target of writing 30 minutes every day. I think on a couple of days I only wrote for about 15 minutes, but I did actually sit out at the computer, think about the story I was working on, and add a few more words to it. I allowed myself to count editing sessions as “writing”, although I didn’t allow myself to rewrite anything until I actually had a finished story. That’s part of my writing process – after earlier writing projects got bogged down endlessly by “editing-in-progress”, these days I just force myself to bulldoze through the first draft, then fix and polish things during the revision process. I chose 30 minutes because that was a short enough time that I knew I could slot it in somewhere most days, but long enough that I’d see some actual progress on the stories. The other important part of the challenge was that I announced it on the Shack Out Back message board, and committed myself up to updating the board every day as I progressed. It wasn’t an ego thing – it was to hold myself accountable. If I started missing days, people would know, and might start harassing me about it. Plus it was nice to get encouragement from a couple of people as I went along – feedback is the fuel that powers the writing engine! 3. Who would you recommend this challenge to? This challenge was about writing, but the technique can be applied to just about every habit you’d like to develop – going to the gym, meditating, eating your fruits and vegies, updating your blog, painting a picture, saying hi to people you might not normally talk to… the sky’s the limit. 4. What advice would you give to anyone starting this challenge? Make your daily commitment manageable – if you set yourself a challenge of running 15 kilometres, or writing for three hours, it’s going to be harder to keep it up. Find some method of keeping yourself accountable. Tell a friend and report back every day. Announce it on Facebook. Post it on a message board frequently. I tried a running challenge at the same time as the writing challenge but without telling anyone about it. Came off the rails around day 15 (days 10 to 21 are the “struggle” days – get to day 21 and it should be smoother sailing the rest of the days). 5. What was the best part of the challenge? Seeing significant process in the stories as the days accumulate. I finished one story and made a good start on a new story. I find completing a story enormously satisfying. That and reading Turtleboy’s comments after I twisted his arm into reviewing the first draft. 6. What was the worst part of the challenge? Trying to write when un-inspired or worse, completely blocked. 7. Did I ever experience writer’s block? I never got *completely* blocked, but at one point I was suffering from a serious case of “the blands”. By that I mean, I felt like the story was going through the motions. I’d call it “and then” writing – “and then his happened, and then this happened, and then this happened.” On that day I stopped writing “Unaccompanied Minor”, I opened up a new document, and just wrote “stream of consciousness” style. It didn’t make any sense at all (ravings of a crazed loon probably better describes what came out!) – it was just about rediscovering the excitement of writing, of putting together words in interesting and unexpected ways that a reading will find pleasant and entertaining, the emotion and the poetry of the language. That change of pace worked pretty well in breaking me out of my slump. I had been thinking about “Unaccompanied Minor” for months so I had a fair idea of where the story would go. Then suddenly it was finished and I had to start a new story. I’d started reading a book which took the form of emails going back and forth between two people (a teenager girl and a celebrity – hmmm, did I just drop some spoilers? ), and I thought a story told through letters would be cool. But I really only had the vaguest idea of where the story would go from there – it felt very much like laying down the tracks in front of a moving train, particularly at the start. What got me through that part was concentrating on the “voice” of the narrator – I wanted him to sound distinctive and unique, and different from my usual characters. Thinking in his voice seemed to make things flow smoother. 8. Would you say it got easier or harder to write every day? Definitely easier. Some days were hard, but in general, writing every day the story would pick up a bit of momentum, and it wouldn’t take me as long to get into the “flow” of writing. Some days I sat down thinking I might only manage 15 minutes, then the 30 minutes would disappear in a flash. It was easier to stay motivated because I could see real progress towards completing the story I was working on. 9. Did you notice any improvements in your writing? Based on the number of mistakes picked up during the proof-reading phase, the “accuracy” of my writing might have actually gotten worse! I’m not sure 30 days was long enough to lead to any measurable improvements in the “quality” of the writing – but it did seem like it was easier to get into a zone where I felt I was producing quality writing. Writing every day over the long term though – I think improvements would be inevitable, as long as you’re actually pushing yourself to improve and not just settling for “good enough”. 10. What was the best time of day for you to write? Some days I ended up squeezing in the 30 minutes last thing before bed. On a few days I think I managed to get the writing in first thing in the morning. But my most common writing time was usually shortly after I came home from work. I wouldn’t let myself play Diablo until I’d got my writing done for the day! If I had the freedom to write whenever I wanted I’d probably do it in the morning – that seems to be my most productive time. But half an hour is short enough that it can be slotted in almost anywhere. 11. If you could do the challenge again, would you do anything differently? I missed one day when I completely forgot. Apart from that I don’t think I would have changed anything. 12. What are the pros and cons of the challenge? According to the theory, after 30 days, you’ll have a habit you can maintain indefinitely. As far as writing goes, you’ll see measurable progress in your story, and your writing probably will improve. And there’s the feeling of accomplishment when you finish. Cons? You have to do your chosen challenge every day, and sometimes life is going to work against getting your writing done (or whatever other challenge you might have set for yourself). When I was doing my running challenge I did a couple of runs in the rain at 10 o’clock at night because I hadn’t gotten ’round to doing it earlier. And if you tell someone about your challenge, you’re going to have to face up to them if you slip along the way. 13. Now that you’ve completed the challenge, will you continue to write on a daily basis? Well, theoretically it should be a habit now, and I won’t even have to think much about writing every day. Continuing to write every day, or close to it, is definitely the plan. Get back to me in a couple of months and I’ll let you know how it worked out! Meanwhile, I’m trying to think of what else I could use the “30 day challenge” format for. 14. If it takes between 21 and 30 days to create a good habit, why do you think it is that it only takes one day to create a bad one? It sounds a bit like a bumper sticker, but I don’t think you pick up a bad habit overnight. I think bad habits develop because they’re the easy option… usually not doing something, unless it’s staying away from the biscuit tin at work (*whistles innocently*). You do it once because you can, and that makes it easier to do again and again.